Professor Tomás Summers Sandoval Jr. explores a key historical site for San Francisco's Latino community. Professor Tomás Summers Sandoval Jr. peeked through the front doors of Nuestra Señora de Guadalupe, a gleaming white church on a steep street at the edge of San Francisco’s Chinatown. Inside, a red light glowed over a patch of black-and-white tile, and a musty odor wafted out, the scent of decades of rites and rituals, of fading memories. 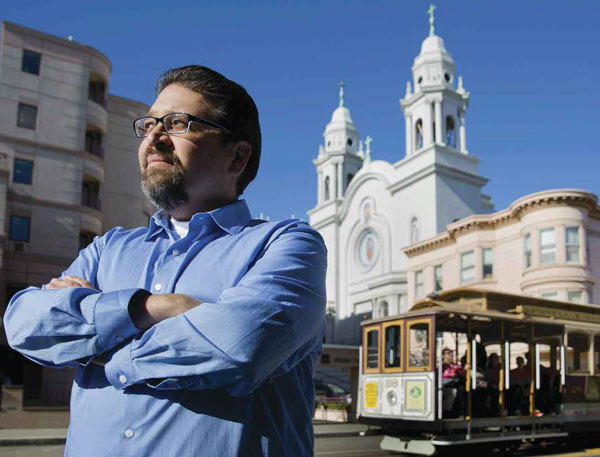 Summers Sandoval wrote extensively about the church—a vital religious, educational, political, and social center for Spanish- speaking Catholics—in his new book, Latinos at the Golden Gate, which explores the rise of the city’s Latino community. In his book, he traces the roots from the days of the Gold Rush when migrants first arrived in search of fortune. By 1871, Latin American diplomats and business elites started raising money to build a Spanish-language Catholic church to unify a diverse population, hailing from countries that had strong rivalries. “We who belong to the Spanish in this city, will never achieve strength or respectability while we do not also have unity,” they wrote in a fundraising circular. Founded in 1875 and rebuilt in 1912 after the city’s great quake and fire at a cost of $85,000, the Moorish Gothic style church could hold 700. The neighborhood around the church (bounded by Columbus Avenue, Filbert, Washington and Jones streets) grew into the Latin Quarter, a residential and commercial district catering to Spanish speakers. The church fostered solidarity, holding a unified Mass commemorating the independence days of Mexico and Chile each September. Parishioners also carried on traditions, continuing the same rituals, prayers and songs on feast days of their homelands. By 1950, though, Guadalupe Church began to decline. The Latino population—which more than doubled between 1945 and 1970—moved to more affordable neighborhoods such as the Mission District. The construction of the nearby Broadway Tunnel displaced some residents and reduced attendance, and Chinatown encroached, transforming the blocks around the church. Yet even when Latino families moved out of the neighborhood or into the suburbs, many maintained strong ties, returning to Guadalupe Church for baptisms, confirmations, first communions and first confessions. Declining membership brought the closure of Guadalupe Church in 1991, and the building eventually housed St. Mary’s School for 15 years. The space is now vacant, and efforts by the Archdiocese to sell the historical landmark met resistance from activists who want to preserve the church for use by the Latino community. From the front steps, there’s a view of the Bay Bridge and the tip of the Transamerica Pyramid, and the street below hums with the sound of cable cars rolling past. The bells are gone from the church’s twin towers, but a stunning mosaic of the patron saint remains on the façade above the front doors, in a red gown and blue mantle adorned with stars, streaming rays of sunshine—the same saint that generations of San Francisco Latinos venerated here.